I've released cfMediaPlayer on RIAForge today. It's a ColdFusion custom tag wrapper to display FLV, MP3, MP4 and AAC files using the JW FLV Player™ with one line of code. For example, <cf_mediaplayer file="myvideo.flv"></cf_mediaplayer>. This tag supports many more options than CF9's newly added cfMediaPlayer tag. Included is a readme.htm file that gives full descriptions on all of the available attributes as well as some detailed usage examples. Download is available at http://cfmediaplayer.riaforge.org/. SVN access can be found at http://svn.riaforge.org/cfmediaplayer. I look forward to hearing any feedback users might have. Thanks! 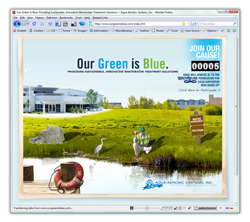 OurGreenIsBlue.com was developed as one part of a larger initiative for Aqua-Aerobic Systems, Inc. located in Rockford, Illinois. The initiative focuses on going "blue" instead of the typical "green" since their primary business centers around "providing sustainable, innovative wastewater treatment solutions." In fact visit the site, "join their cause" and they will donate $1 to the WateReuse Foundation! The site is powered by Adobe® ColdFusion® along with Adobe® Flash®, ActionScript 3.0 and Microsoft® SQL Server. The eye-catching design and interface was created by Gordon B.